*We require a week stay with arrival on Saturday during peak season unless unit isn’t booked 28 days prior to arrival date. Within 28 days we require a 3 night stay. Deposits are refundable less a $50 cancellation fee if reservation is cancelled prior to January 1. If reservation is cancelled after January 1 then the deposit is non-refundable. 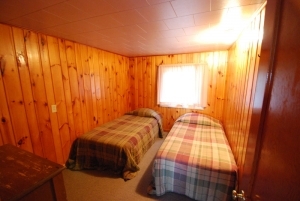 Cabins at Birch Forest Lodge are priced per cabin up to the maximum occupancy. Check cabin details for occupancy number for each cabin. If total number of people in cabin exceed the max occupancy additional charges will apply. 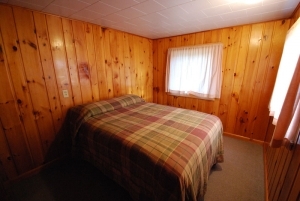 Price is $20 per night or $100 per week (per person) regardless of age of occupants. All reservations require a deposit. Deposits can be made with any major credit card. They can also be made by personal check, but must be received within 10 days of booking your reservation. Balance is paid upon check-in. Your vacation begins at 2 PM. Please NO early arrivals. We have very little time to get the resort ready for our new guests. Arrival prior to 2 PM will result in a $50 early-arrival fee per cabin. Check out is 8AM. If you will be arriving late to the resort, we ask that you call us and let us know. This is particularly important if you have never been to Birch Forest Lodge before. Renter is responsible for the entire reserved length of stay. Refunds are not given for bad weather. For full list of policies please see our policy page. Cabin 6 has 3 beds and a futon sleeper. Cabin 6 can sleep up to 6 people. This cabin is ideal for a family or a small group. 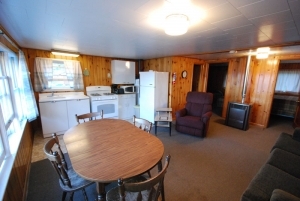 This traditional 2 bedroom cabin rental is located very close to the dock. 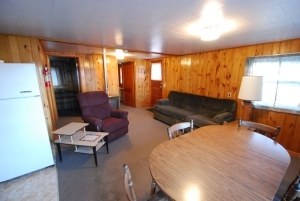 Generous living area with a great view of beautiful Pelican Lake! 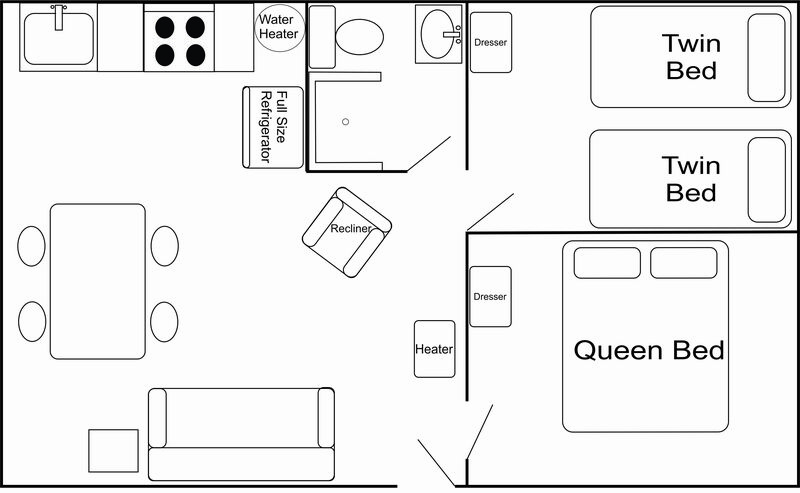 One bedroom has a queen bed while the other has two single beds. The main room has a futon which folds down for an additional full size bed. Max occupancy is 6 people. During peak summer season cabin 6 is rented on weekly basis from Saturday to Saturday. Our 2019 Summer season begins on May 24th for Cabin 6 and runs through Friday August 9th. The Fall season starts on Saturday August 10 and will run till October 1st. 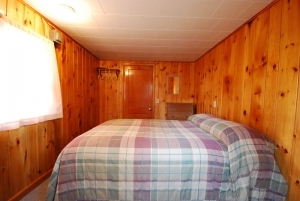 For the Spring and Fall seasons Cabin 6 is rented on a 3 night minimum. All cabins are non-smoking cabins and pet free. Cabin 6 guests also have access to the resort canoes, kayaks and stand up paddle boards for no additional cost.